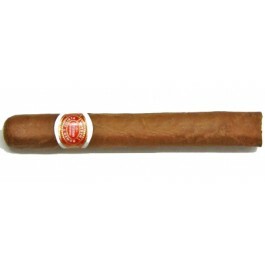 The Romeo y Julieta Regalias de Londres is an affordable and medium bodied Coronitas, of 40 ring gauge, 4.6” (117mm) long and comes in a box of 25 cigars. It is a short smoke (40 minutes on average) and yet it delivers complex and very balanced flavors. There are a lot of herbal notes, some wood, nuts, coffee and some caramel notes. This is a great go-to-smoke as it is easy on the wallet and provides a delicious smoking experience. A must try. The Romeo y Julieta Regalias de Londres is an ideal medium cigar for a short break. • Complex cigar, with a lot of herbal flavors, plenty of wood and some nice spicy notes. • Great aging potential. 4 to 5 years are recommended for an even more complex and mellower smoke. This cigar simply is simply a great and inexpensive everyday cigar. The Regalias de Londres has a nice and elegant look with a medium brown wrapper. There is a thin oily sheen on the surface and the cigar has a slight box press. At cold, the foot emits some tobacco aromas as well as some notes of hay, caramel, sweet chocolate and some hints of citrus. The pre-light draw is good, and gives some herbal flavors of cacao, some pepper andn some chocolate notes. Once the cap cut, the draw is great throughout, not too tight, nor too loose. Upon lighting the cigar, spicy flavors and notes of citrus reach the palate. The smoke is white and chewy and has fresh earth aromas. The ash holds up beautifully at the foot, with a nice dark gray color, that builds up for about 2 inches. No issues to report on the burn. The body of the cigar starts on the milder side when lighting up the cigar, the dominant flavors are of wood and of pepper. There are also some sweet notes of chocolate, and some bitter notes of coffee. At times there are also hints of mint. The balance of flavors is very good and the cigar is very appreciable. In the middle third, the dominant flavors are mostly the same. The coffee is more noticeable at this point, as well as some floral notes. There is also a good amount of caramel sweetness and some citrus notes. The cigar is now a medium body and so far it is very pleasant. In the final third, the spiciness of peppers ramps up, but it is very natural and enjoyable. The citrus notes recede and there are now more earthy flavors as well as some delicious cinnamon flavor. The cigar ends on a medium body. In summary, it is a very delicious, affordable and consistent Romeo y Julieta, a great every day smoke.